Most of the secular enterprises are in no need of money. The banks advertise that they will not receive money on deposit. Thousands of merchants, mechanics, and others have for months been greatly troubled because they have on hand so much money, and don’t know how to invest it. To all such, and to as many more as it may concern, I beg to state that the Army Colportage cause needs funds, and presents very fine inducements to those wishing to invest. 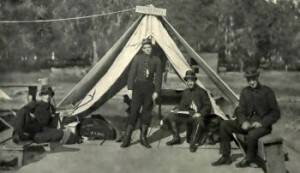 The funds are needed to supply our soldiers with the word of God–to gladden their souls amid the toil, and privations, and sins of the camp–to comfort and sustain in the dreary gloom of the hospital, and to prepare for the “better life.” What patriot would not gladly invest in such a behalf?–Whatever of earthly possessions you may have, are valuable simply and soley because protected by the strong arms and brave hearts of our soldiers, by which you, and yours are sheltered from the ravages of the invader. Is it not appropriate, then, that a portion–a liberal portion–of these possessions be devoted to the army? We need money, and with an unwavering faith in our cause and in the hearts of our people, we make this appeal.